I first noticed it when our family lived along Lake Michigan for eight years. 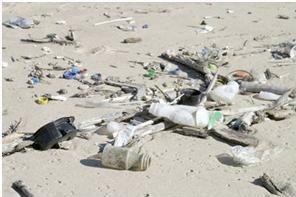 Walking along the beach I would see all kinds of human debris that had been washed ashore. Remnants of balloons, shoes, sunglasses, pieces of wood, plastic of all kinds, and most disturbing, thousands of syringes and other medical waste. Periodic volunteer clean-up days were organized along the beach, but it didn’t solve the problem of why medical waste dumped into Lake Michigan in Wisconsin found its way to Pentwater. It’s no wonder pregnant women at the time were warned not to eat Lake Michigan salmon because the fish were contaminated. The first thing God created in our world was water. Why? Because life cannot exist without clean water. No plant life, no animal life, no human life. In water there is an amazing power for destruction as well as life. Last summer we had an extreme dry spell in West Michigan and lamented the terrible effect that the drought had on our farm crops. Now we’ve experienced devastating flooding that has caused rivers to crest at levels never seen before. Buildings in downtown Grand Rapids have been water-logged, all or parts of fifty roads in our county were impassable, and homes, businesses, and even churches sustained damage as volunteers desperately tried to hold the water back. While West Michigan residents have come together to help one another, water is a daily matter of life and death for many of our world’s people. Even though the fresh water of Lake Michigan seems like an ocean to visitors who have never seen a lake that large, our world’s actual oceans cover more than 70 percent of our planet and contain 97 percent of all living matter. Our diverse and fragile marine ecosystems have a critical impact on humans since oceans partly determine weather patterns, serve as the Earth’s “lungs,” produce food, and contribute to tourism and recreational opportunities. The health of these ecosystems as well as ocean wildlife is threatened, however, by coastal development, pollution, overfishing, tourism, and a host of other human activities. Did you know that the world’s largest landfill is in the central North Pacific Ocean? It’s called the Great Pacific Garbage Patch. This is a giant floating island of human debris, mostly plastic, that is about twice the size of Texas and is trapped by the current of the North Pacific Gyre. 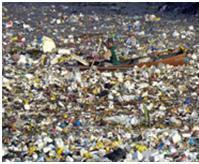 The Great Pacific Garbage Patch contains over 100,000,000 tons of trash. 80% of the garbage comes from land and 20% comes from ships at sea. It takes about five years for the ocean currents to carry a piece of garbage from North America to this spot. Compounding this disgraceful testimony to human waste, 90% of all trash floating in the world’s oceans is plastic, which is not biodegradable. The United Nations Environment Program estimated in 2006 that every square mile of ocean hosts 46,000 pieces of floating plastic. Plastic does break down into small pieces as it floats, but once plastic, always plastic. When the plastic is tiny enough, it can be mistaken for zooplankton, ingested by aquatic organisms or birds, enter the food chain, and actually end up on our dinner table. When I think of the importance of water for the health of our world, I remember the phrase “the tragedy of the commons.” I first encountered this term a year ago when Time magazine named Elinor Ostrom as one of the 100 most influential people in the world. The tragedy of the commons is a term used in economics to refer to the depletion of a shared resource by individuals who act independently according to their own self-interest even though they understand that depleting the common resource is contrary to the best interests of the group. Ostrom worked at the University of Indiana and focused her research on the governance of common resources such as air, land for grazing, fishing areas, forests for timber, and water for the irrigation of farmland. The problem is that these resources are exploited by individuals for their own gain without considering sustainability for themselves and others, thus causing disastrous consequences. Garrett Hardin first coined the phrase “the tragedy of the commons” in a 1968 article by the same name in the journal Science. Before Ostrom’s research, the solution to “the tragedy of the commons” was either to privatize resources or form a totalitarian state to manage the resources. Instead, Ostrom demonstrated that within communities, shared rules can emerge from the bottom up to ensure sustainable, collective management of resources that is also economically viable. All of the world’s most persistent problems can be solved by collective decision-making and conflict resolution. Elinor Ostrom, who died in June 2012, just months after receiving Time magazine’s honor, was in 2009 the first, and currently only, woman to win the Nobel Prize for Economic Sciences. Our charge as disciples is to convey the teachings of Jesus to others by our words and actions. We represent a Jesus who loved little children, valued women, showed mercy to Roman centurions, advocated for the poor, expressed care for plants and animals, and insisted that we share our resources with those who have less. If Jesus were here today he would be “in our face” that justice extends to the environment as well and that the poor and marginalized are most affected by matters of climate change, toxic waste, and resource depletion. He would not mince words that the grave ecological crises of our time are caused by our own human actions. Jesus would remind us God loves all people in the world, not just Christians but Hindus, Muslims, Buddhists, Sikhs, and Jews as well. Jesus would also emphasize that the one thing all human beings have in common besides God’s unconditional love is the fact that we live on the same earth, breathe the same air, drink the same water, and receive warmth from the same sun. Last April several seminaries around the country formed a Seminary Stewardship Alliance (SSA), which is “a consortium of schools dedicated to reconnecting Christians with the biblical call to care for God’s creation. Our goal is for member seminaries to teach, preach, live, inspire, and hold each other accountable for good stewardship practices. The Christian faith occupies a central role in our culture. Seminaries equip, train, and inspire the future leaders of the church, thereby having a powerful effect across denominations and throughout the world.” (seminaryalliance.org) Three of the seventeen member seminaries are United Methodist. On Earth Day 2012 three of our world’s great environmental leaders were present at the inauguration of the SSA at the National Cathedral in Washington, D.C.: Bill McKibben, Wendell Berry, and Wes Jackson. At that time member seminaries signed a covenant to integrate creation care into the core of their curriculum. The tragedy of the commons may be symbolized by the Great Pacific Garbage Patch, our testimony to human degradation of our earth. Yet the “glory of the commons” is what will ultimately save our planet. The glory of the commons is that we all rely on the same Brother Sun, Sister Moon, Brothers Wind and Air, Sister Water, and Brother Fire. As the human race walks this journey together, we are literally grounded on the same Mother Earth. Together we can save our world. How will the church be our best hope – the glory of the commons – and lead the way? This entry was posted in dsblog and tagged ecology, environment, ocean, water by Bishop Laurie Haller. Bookmark the permalink. What a great Leading from the Heart essay, Laurie! We can point out our foibles when it comes to our treatment of the environment but I am afraid the sin of greed is very hard to overcome. Thank you Laurie for these words. We are all responsible and each and everyone of us can make a difference.